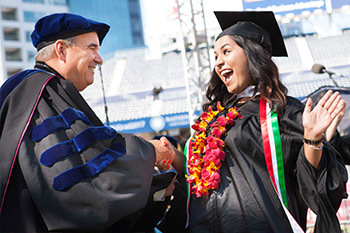 President Andrews congratulates graduates as they receive their diplomas at the commencement ceremony in Petco Park on June 17, 2017. On Saturday, June 17, we celebrated the extraordinary accomplishments of over 2,000 graduates at our 45th commencement ceremony. 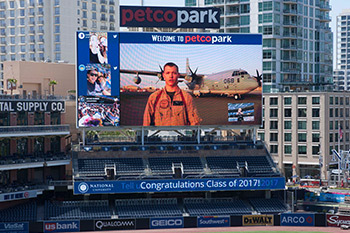 More than 20,000 attendees, including graduates and their families, friends and loved ones packed into San Diego’s Petco Park to congratulate the class of 2017! I am so proud of our graduates for their dedication and hard work toward achieving their educational goals. However, I also want to thank all of the faculty and staff who supported our students throughout their academic journeys. And I’d like to extend a special thank you to those who worked that Saturday at Petco Park to help make graduation a truly spectacular event for our graduates and their families. It was an honor to welcome San Diego City Council President Myrtle Cole as our keynote speaker. Ms. Cole is an alumna of National University and delivered an inspiring speech to the class of 2017 about pursuing passion in life. She has been in the same position as many of our students, who work full time while going to school. Through her perseverance in overcoming obstacles and with her dedication to public service, she truly embodies the attributes of empowerment, dedication and compassion that serve as a benchmark for all of our graduates. President Andrews and SHHS Dean Gloria McNeal at a special ceremony for graduate, Francis Oladipo, who serves with the U.S. Navy. That includes graduates such as Catherine Turner, who came to NU through the Vets2BSN program and earned her Bachelor of Science in Nursing. Catherine’s husband is in the military and when he received orders to move the family to Florida, along with their three sons, Catherine remained dedicated by flying back and forth to California to finish the last six months of her clinical classes. About 25 percent of the graduating class was active or former military personnel, which mirrors the general student population at NU. We are so proud of those students but some of them were unable to attend the ceremony, as they are serving our country overseas. We were able to honor all of our deployed graduates and two in particular: Sergeant Jameson Kaye, who serves in the Marines, and Francis Oladipo, USN, Petty Officer Third Class. NU student, Sergeant Jameson Kaye, delivers a special message to fellow graduates. Jameson Kaye’s wife Chelsea, who is an NU alumna, called to let us know that Jameson was deployed in Kuwait and would not be able to receive his Bachelor of Business Administration on June 17. Chelsea attended in his place and we were able to play a special message from Jameson to his fellow graduates on the Jumbotron. Francis Oladipo serves on the USS Anchorage, which was delayed returning to San Diego in time for Saturday’s ceremony. 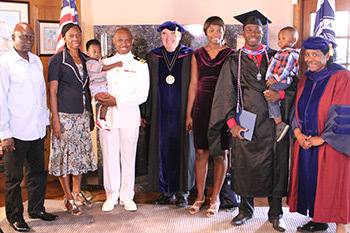 I am thrilled that we were able to give him a special ceremony which included his commanding officer, shipmates, family and his parents, who flew from Nigeria to see him receive his diploma. Watch the special ceremony. It fills me with joy to see our graduates receive their hard-earned degrees, as their loved ones cheer them on. Michelle, Kimberley and Christopher Plummer are three siblings who encouraged each other to go back to school and earned their degrees together on June 17, proving that it’s never too late to achieve your goals. This year, I was able to see one of my dreams come true as well. I’ve always wanted to slide into home on a major-league baseball field, and I couldn’t contain myself as I was walking past third base. Watch the video to see how our wonderful graduates inspired me to go after my dream!